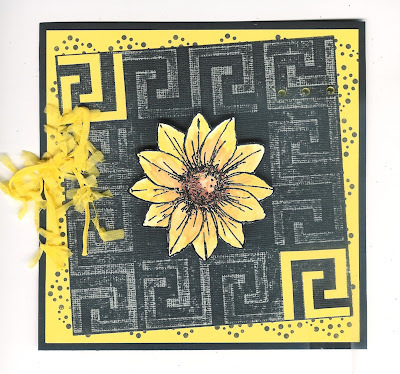 Jennifer here, my card for today was made in May last year and uses the Greek Key stencil, Daisy stamp and Mica Powders which can be purchased from Imagination Craft's web site. The yellow background was stamped using the 'Dot' stamp from the Summer Decoupage Stamp Set - Fuschia and was stamped using a black inkpad. I used a piece of Core'dinations Black Magic card and the Greek Key stencil and put them through an embossing machine. I then sanded the surface of the stencilled card. This was then fixed to the yellow card on a slight angle. On a piece of white card, I stamped the daisy using a Versamark pad and heat embossed using black embossing powder. I cut out the daisy head from the image and coloured it using the mica powders, water and a paint brush. I then Fixed the daisy head to the centre of the stencilled black card using sticky foam pads to add some Dimension. A bow was added to the left-hand edge of the card. Using a pencil and some of the yellow card, I traced around two of the Greek Keys and cut them out, then glued one to the top left and the other to the bottom right corners. Three adhesive gems where glued to the top right. That's it Friends, hope you like it. Back with another card soon, in the meantime - happy crafting ! Jennifer here, hope everyone feels happy and relaxed after the Bank Holiday, a time for all of us to have some 'me' time. 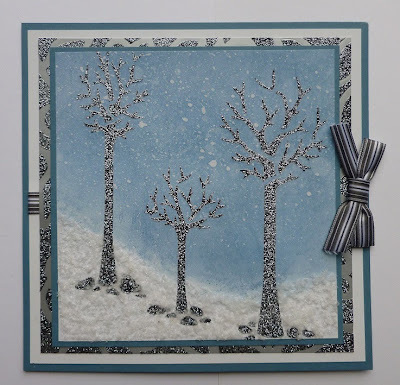 The card I am showcasing today is a follow up to my Autumn card which was shown on the blog recently and this is the Winter version of Imagination Craft's Three Trees Stencil, which was shown on QVC in January this year. This stencil is really versatile as you can just add leaf buds for Spring, flowers for Summer, leaves for Autumn and of course a Winter tree. So here goes, this is how I made it. The base card was made from blue cardstock and a piece of white paper matted onto it, leaving a border of blue showing. I fixed some ribbon across the centre and secured it on the reverse then matted it onto the blue card. I then took the shiny silver card and the Vine Trellis Stencil and I spread the Gunmetal Sparkle Medium over the stencil. Once dried I matted it onto the white paper. Using the white shiny card, I coloured the sky using Distress Inks and sprinkled tiny drops of water on it to look like falling snow. I put the Three Trees Stencil on top and spread the Sparkle Medium over it. Hey presto ! that's it finished. Why don't you have a go at making it, get an early start with your Christmas cards, if I dare mention that word yet lol ! Bye for now, I'll be back soon. Jennifer here, hope you are all enjoying your holiday weekend and fitting in plenty of crafting time. I have spent most of my weekend topping and tailing thirty-seven pounds of gooseberries ! can't wait to get back to some crafting lol !! I know which I would rather be doing ! 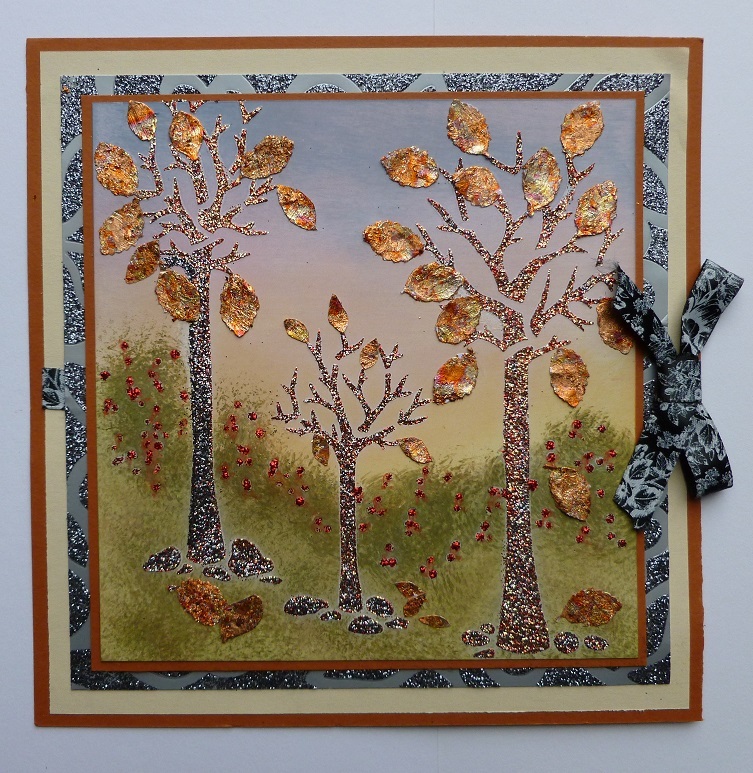 My card today was made using the Three Trees and the Vine Trellis Stencils, I decided to make a set of four, Spring, Summer, Autumn and Winter - todays card is Autumn. Base card is made from terracotta coloured card. Wrap a piece of ribbon around some cream card and mat onto the terracotta card. Take the shiny silver card and lay the vine trellis stencil on it and spread the gunmetal sparkle medium over it. When dry, glue to the cream card, leaving some cream showing. Take the white shiny card and colour using distress inks. Lay the three trees stencil on top and spread the sparkle mediums over it. When dry, add some red glitter glue to the skyline to look like red berries. Punch out many leaf shapes, coat with stencilling glue and cover with stencilling flakes. Glue these leaves to the two larger trees and cut out some smaller leaves for the small tree, and glue in place. Trim a piece of terracotta card to fit the silver card, leaving a border of silver showing and fix to the silver card. 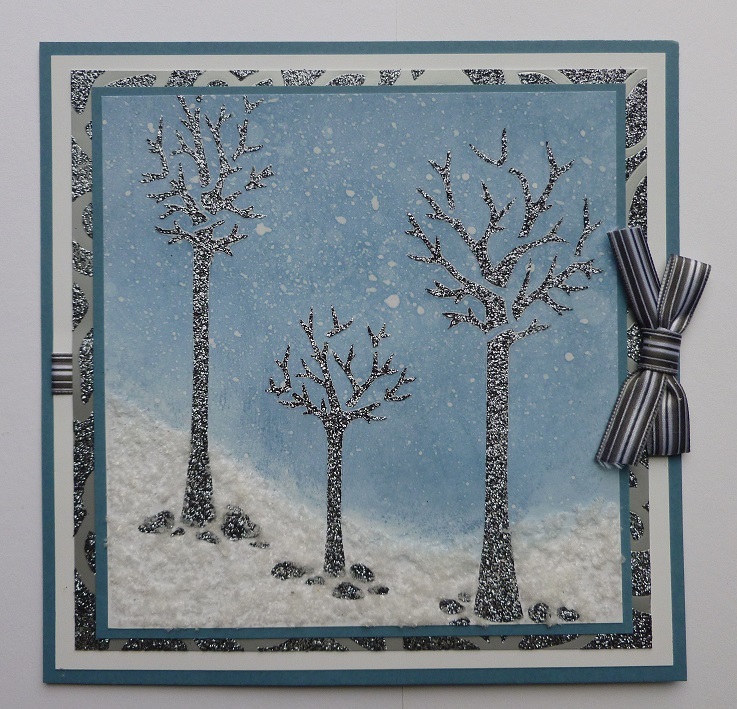 Trim your tree image down slightly to fit the terracotta card, again leaving a tiny border showing. 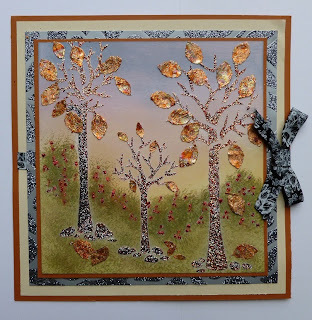 Add a bow to the right-hand side of the card and glue some fallen leaves to the grass. That's it Folks - finished ! !